Greek mythology is like a convoluted dream with a cast of thousands. One such story is that of Odysseus. We all know Odysseus as the wandering hero of Homer’s Odyssey and Iliad epics. But, few know the back story and how life was for Odysseus outside of Homer’s epics. It’s an exhausting story. Thanks to www.greekmythology.com for bringing this literature to the public domain. To start, Odysseus was the son of Laertes and Anticlea, and is well known as an eloquent speaker, ingenious and cunning. Before the Trojan War started, Odysseus was one of the suitors that wanted to marry Helen, step-daughter of king Tyndareus of Sparta. However, the suitors were many and there didn't seem to be a way to solve who the husband would be. Odysseus told Tyndareus that he would provide a solution if he helped him marry Tyndareus' niece, Penelope. Tyndareus agreed and Odysseus proposed to draw straws. Before that, though, he made everyone swear an oath that they would all support the husband and wife in any ill fate that they might face in the future. 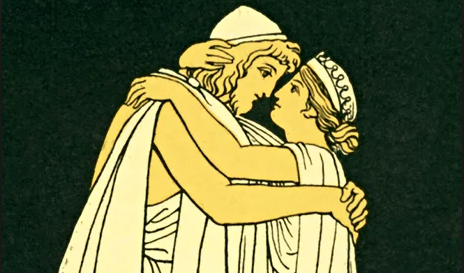 As a result, Menelaus drew the lucky straw, while Odysseus married Penelope. After Helen's abduction by Prince Paris of Troy, all suitors were summoned to help Menelaus in his quest to bring her back. Odysseus did not want to join the expedition, for an oracle had informed him that if he participated, it would take him a long time to return home. So, he decided to feign madness by harnessing a donkey and an ox to a plough and sowing salt on a field. Palamedes did not believe that Odysseus was actually mad, so he put Odysseus' baby boy Telemachus in front of the plough; Odysseus immediately changed course, thus exposing his plan. For this reason, Odysseus always had a grudge against Palamedes since then. After Odysseus' plan was foiled, they all tried to recruit the hero Achilles, as an oracle said that the Trojan War would be won only if Achilles joined. Before they reached the island of Scyros where Achilles lived, his mother Thetis disguised him as a woman, because of another prophecy that said Achilles would either live a long, peaceful life, or have a glorious death while young. Odysseus made a plan to find out who Achilles was, among the women; he laid various weapons on a table, and Achilles was the only one who showed real interest in them. Odysseus then sounded a battle horn, and Achilles instinctively picked up a weapon ready to fight. As a result, Achilles joined in. After the Greeks reached Troy and the war started, Odysseus played a particularly influential role as a strategist and advisor. He was the main character who maintained the morale of the Greeks in a high level, and managed to prevent Agamemnon from withdrawing from the war. He also managed to appease Achilles' rage when Patroclus was slain. However, holding a grudge against Palamedes, it seems that Odysseus played a role in his demise; some versions say that Odysseus made a plan to expose Palamedes as a traitor and was stoned to death. According to another version, Odysseus and Diomedes told Palamedes to descend a well because of a treasure that was supposedly hidden there; when Palamedes reached the bottom of the well, the two men buried him inside. Odysseus was most famous in the war for his contribution to create the Trojan Horse, a huge wooden horse that was supposed to be a gift to the Trojans by the retreating Greeks. The Trojans accepted the gift joyfully and started celebrating around it. When the night fell and everyone was drunk, the Greek warriors, who had hidden in the hollow body of the horse, revealed themselves and slew the Trojans, winning the war. After the Trojan War, Odysseus made a ten-year journey to reach his home, Ithaca; his adventures were recounted in the epic Odyssey. On his way home, storms led Odysseus' ships to the island of the Cyclops Polyphemus, who started eating the crew of the ships. Odysseus managed to trick Polyphemus and along with his companions, blinded the Cyclops. Before they left, though, he did the mistake of revealing his identity to Polyphemus, who then told his father, the god Poseidon; this had a major impact on the hero's travel, as the god sent rough seas throughout the journey. The ships then reached the island of the god of winds, Aeolus, who put all winds except the west wind in a bag and gave the bag to Odysseus. As a result, the west wind blew the ships all the way to Ithaca. However, just before they reached the shore, Odysseus' companions took the bag of winds from Odysseus, and thinking it contained gold, opened it and released all of the winds. The ships were blown away from the island, back to where they had started. Aeolus did not accept to help them again, and they left. They went to the island of the Laestrygonians, a cannibalistic tribe that ate all of the crew, except that of Odysseus' ship. They quickly left the island and reached that of the witch Circe. She turned Odysseus' companions into pigs, but Odysseus, who had been given a magical herb by Hermes, resisted her witchcraft. Circe fell in love with Odysseus and transformed the pigs back into men. After they stayed on the island for one year, they left to continue their voyage. They reached the western edge of the world, where Odysseus took advice from the spirit of the prophet Teiresias, and later encountered his mother's spirit, who told him that back home, his wife Penelope was being surrounded by potential suitors. They then returned to Circe's island, who advised them on how to continue; they managed to avoid the Sirens, as well as the monsters Scylla and Charybdis. In the island of Thrinacia, Odysseus disregarded the advice of Teiresias and Circe, and caught the cattle of the sun god Helios. Helios, enraged, demanded that Zeus punish them, or he would make the sun shine in the Underworld. Zeus obliged by causing a shipwreck in which only Odysseus survived. He reached the island of Ogygia, where the witch Calypso kept him captive for seven years, before Hermes intervened and released the hero. Odysseus then reached the island of the Phaeacians (the modern day island of Corfu), who helped him reach his destination. He reached Ithaca late at night, and he was disguised by Athena as a beggar in order to learn what had happened during his absence. Penelope, his wife, had just announced that she would marry the person who was able to string his husband's bow and then shoot an arrow through twelve axe shafts. She knew that this was impossible to do for everyone except her husband. None of the suitors managed to do it, but Odysseus still in disguise completed the challenge and revealed himself; helped by his son Telemachus, he slew the suitors. Penelope did not believe that it was her husband but instead a god in disguise. To believe him, she asked him to move their bed to another room. Odysseus said that this was impossible, as he had made the bed and knew that one of the legs was a living olive tree. Years later, the son of Odysseus and Circe, Telegonus, reached adulthood and wanted to meet his father. He went to Ithaca, but as he reached the shore, he killed some sheep as he was hungry. Odysseus went and fought with him, not knowing who the other person was. Odysseus was eventually killed by Telegonus. Telegonus took Penelope and Telemachus to the island of Circe, where she made them immortal.